Matt Stowers, left, and the No. 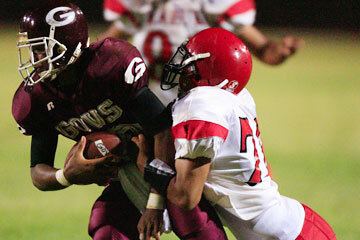 7 Farrington Governors face No. 8 McKinley tomorrow night in a key OIA Red East matchup. A year ago, the Farrington Governors were pumped up about being on TV. When the seventh-ranked Govs take the field tomorrow against McKinley, things will be a bit toned down. The novelty of being on the air has worn off a bit, and the Govs are more concerned about executing against a resurgent McKinley team. "The team is pretty even-keeled about TV now," Farrington coach Randall Okimoto said. That sense of perspective and experience will help the Governors, who fell to Kahuku last week and share first place in the Oahu Interscholastic Association Red East at 3-1 with Kahuku, McKinley and Castle. Okimoto, one of the top running backs in Farrington history, knows plenty about old battles between the Govs and Tigers. The 2006 Tigers are a throwback team of sorts. "They've very opportunistic, with big linemen up front," he said. The Tigers are coming off a 14-13 upset of Kahuku on Sept. 23, prompting coaches and media to vote them No. 8 in the latest Star-Bulletin Top 10 poll. On top of the big win, McKinley players are ecstatic about their first appearance on TV in recent memory. "They are pretty hyped. Before this, they wondered, 'How come we're not on TV. How come were not at (Aloha) Stadium,' " first-year coach Bobby Grey said. "I said, 'I don't want to be on TV to be somebody's whupping boy. I want us to be on TV 'cause we earned it.' The team has earned it. They're stoked." The game will be played at Mililani High School. Both teams are without starting quarterbacks. Farrington's prolific passer, Elijah Filifili, suffered a broken index finger nearly three weeks ago and is still healing. McKinley's field general, Tilton Kaluna, suffered a broken left collarbone in the win over Kahuku. Filifili is close to returning, but Okimoto will not rush the process. His team has already clinched a playoff berth, and winning the Red East means nothing more than a higher seeding. State-tournament berths are determined in the playoffs. "He's out at practice every day, working out," said Okimoto, who noted that Filifili is not in pads. The senior had complete grasp of offensive coordinator Elroy Chong's complex West Coast offense this season. He passed for 788 yards in Farrington's games against Waianae, Moanalua and Farrington, with seven touchdown passes and only two interceptions. Then came the freak injury, which occurred two days before the Govs' game against Kailua. Filifili has pleaded with his coach, but Okimoto is preaching patience. "There's no negotiation," Okimoto said. Farrington has the benefit of a backup, Maeli Siliga, who has been in the saddle for a few weeks now. Formerly a starting wide receiver, he was a JV quarterback. The Tigers boast one of the toughest defensive units in the league, but depth is an issue. Kaluna, who lost most of last year due to a concussion, will be missed. Isaac Iuta, son of former McKinley great Kaiser Iuta, will take over at quarterback. "He's learning quickly," Grey said of the Nanakuli transfer. "He'll still play both ways if we need him. Tilton has been helping Isaac out, getting his reads down." Defense has been the anchor of the team, permitting just 54 points in four Red East games. "Peter Salavea, our defensive coordinator, has done a great, great job," Grey said. McKinley has a wealth of talent in its 3-4 defense. Keawe Kalama, who has turned in two outstanding performances at running back in recent weeks, is the other inside linebacker. Mike Leakona and Micah Helsham are the outside 'backers, and Iuta's younger brother, Isaiah, was called up recently from the junior varsity. Kalama has drawn interest from Boise State. "He's an awesome athlete," said Grey, who grew up in Idaho and still has contacts there. The Tigers are a definite darkhorse who could make a serious run for the OIA title. Grey wants a simple, well-executed performance. "We have to make sure we control the ball and control the tempo, and keep believing in each other, keep having faith in each other," the former Moanalua assistant coach said. "Our defense just needs to do what they've been doing." While Kaluna heals up -- Grey hopes to have him back in three weeks -- safety Josh Ward will return. He's been sidelined since suffering a concussion against Castle three weeks ago. The Surfriders and Na Menehune are fighting for playoff rights. Moanalua's Jordan Monico has been the best running quarterback in the league. In six games, including nonconference play, he has 652 rushing yards (6.5 per attempt) and 11 touchdowns. Savai'i Eselu, Na Menehune's highly-recruited defensive end, has been a powerful blocker in the option scheme. He has 11 receptions for 160 yards. Kailua's Kortney Yano stepped in at quarterback against Kalaheo last week. He fired a 31-yard touchdown pass, and did not commit a turnover. Shaun Forges and Keenan Gonda combined for 189 yards on the ground. The Knights have the honor of facing the Red Raiders two weeks after Kahuku was upset by McKinley. Tougher yet, the game will be at Carleton Weimer Field, where Kahuku is virtually unbeatable. The Knights, of course, won't be intimidated. They've beaten Kahuku in recent years, and they had two weeks to prepare. "The bye gave us time for some of our wounded to mend, focus on fundamentals and clean up some other little things," longtime coach Nelson Maeda said. "It gave our team a break to re-energize as we head into our showdown with Kahuku." Lehi Aumua has posted back-to-back 100-yard rushing games for Kahuku. Castle quarterback Bryson Ukauka has been one of the top passers in the league. The Mules have endured plenty of bumps in the road this season. It won't get any smoother at Aiea, where Na Alii are trying to get healed up. Aiea amassed a ton of yardage (350) but just 21 points in a loss at Waianae last week. Lofa Liilii made a spectacular return with 14 receptions for 154 yards. Defensively, Leilehua ranks first in the Red West in total yards, which makes this matchup compelling. Mason Koa runs the Hurricane offense with little pizzazz and a lot of grit. Last week, he ran for 143 yards in a loss at Leilehua. He'll need his main target, Aaron Santiago, though. The speedy senior missed last week's game with an injury. Radford, meanwhile, isn't out of the playoff chase yet. Quarterback Justin Lord has played like a mere mortal (130 yards against Waianae, 169 against Campbell) since throwing for 383 yards against Aiea three weeks ago. The Chargers fell at Kaiser last week and missed an opportunity to seize command of the conference. It won't be simple with Anuenue, a team that it beat 7-6 in August. Antoin Dewalt led Pearl City with 153 rushing yards last week. The Rough Riders have hit their stride. Last week, they knocked off one of the frontrunners, Kaimuki. Kaiser, meanwhile, has a chance to gain control of the conference race. Cougars running back Isaac Saffery is a serious playmaker who will test Roosevelt's improving defense. Statistics and win-loss records go out the window when these schools meet, regardless of the sport. The past few seasons have given new meaning to the rivalry, though. Punahou is the defending league Division I champion, while Iolani has captured the past two D-II crowns. The Raiders are coming off a bye week, while Punahou is stinging from a narrow loss to Saint Louis. Punahou's young but maturing defense has surrendered less than 100 passing yards per game, while Iolani's Ryan Dung leads the ILH with 345 yards on 57-percent accuracy in two league contests. Iolani's young, undersized defensive unit has been battered on the ground, allowing 302 yards per game in ILH play. Two of the state's top running backs, Mililani's Jordan Torres (234 yards) and Damien's Kama Bailey (301 yards) amassed their single-game highs against the Raider defense. Bailey has averaged 230 yards rushing in two ILH games, breaking off 7.8 yards per carry. His six touchdowns in those two games came against the league's Division II squads. Kamehameha, coming off heartbreaking losses to Saint Louis and Punahou, the top two teams in the state, has permitted just 80 yards per game on the ground. Something has to give. The Warriors are coming off a well-earned bye week, but Damien has been resting for two weeks. George Martin has completed 56 percent of his passes without an interception for the Monarchs. If the senior completes enough of his passes, Damien could give its neighbors up the hill a serious threat. The Crusaders are marching with unity and purpose. Kenton Chun and Jacob Barit have been outstanding and consistent in the kicking game, and the long-snapping snafus of the early season are long gone. Micah Mamiya's emergence at quarterback makes the Crusaders the most balanced team in the league. In their last game two weeks ago, Pac-Five racked up 342 total yards against Iolani, yet scored only 14 points in a loss. The Wolfpack have enough firepower in Jordan Ho-Ching and Shandon Augustus, but they'll need to avoid turnovers to give Saint Louis their best shot. The Vikings and Warriors have been longtime rivals regardless of their place in the league standings. A defensive stalemate is in order since Waiakea has scored just 42 points in five games (not including a rout of Ka'u), and Hilo has averaged 15 points per game. Bronson Kaneao is one of the league's top rushers, but he may not get his usual workload against the outnumbered Trojans. The Red Raiders and Menehunes were expected to have a close game last time, but Kauai ran away with a 30-0 win. Kauai limited Waimea to less than 100 yards on the ground. Na Alii won the first-round matchup between these teams 41-7.